Every year over 2 million people worldwide are affected by upper gastrointestinal bleeding, a condition associated with significant mortality and health economic burden. Currently, the only definitive way to diagnose those suspected of bleeding is by an endoscopy. However, the procedure is expensive, invasive and not always immediately available, and developing new solutions could increase access to care and improve patient outcomes. 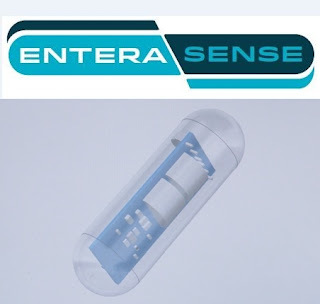 The Irish startup EnteraSense is developing an ingestible biosensor that detects bleeding in the gastrointestinal tract. The sensors are called Sentinel, and is swallowed as a capsule by the patient, which collects data that is wirelessly transmitted to a PC, tablet or smartphone. This provide real-time detection of upper gastrointestinal bleeding, allowing clinicians to treat the patient faster and speed up emergency department triage procedures. Upper gastrointestinal bleeding costs an excess of $5 billion to the healthcare system, and has been estimated to account for up to 20 000 deaths annually in the US alone. Early detection and prompt medical attention is key to survival. EnteraSense has designed an innovative solution based on cutting edge technology that will change how upper gastrointestinal bleeding is diagnosed. By enabling real-time early detection and monitoring, patients can receive immediate treatment to stop their bleeding. The affordable and noninvasive nature of the technology will increase access to care and improve patient outcomes, while significantly reduce associated costs. EnteraSense is based at the National Digital Research Centre, where it has participated in the Launchpad accelerator program. The startup was founded by Donal Devery, who has more than 20 years’ experience of product development and technology commercialization, Christopher Thompson, director of developmental endoscopy at Brigham and Women’s Hospital in Boston and instructor in medicine at the Harvard Medical School. The technology is currently at the prototype stage and was initially developed in the US by Partners Healthcare Innovation. EnteraSense has licensed the technology and is working to further refine it and is expecting to get regulatory approval in the second half of 2017, before launching in 2018.